I needed to go into the city this last Saturday in order to attend a seminar, and although I was looking forward to the day it felt a bit wrong to be ‘commuting’ into the CBD on a weekend. 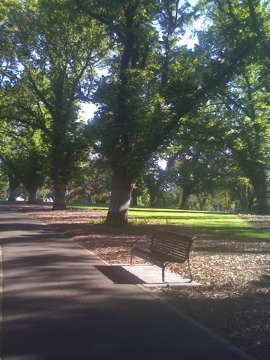 However, all was forgiven as I walked through Flagstaff Gardens. It was a glorious spring morning, a 10 out of 10 day. How lucky we are to be able to smell the greenness, feel the freshness, and see the blue skies. Happiness really is to be found in these simple moments.